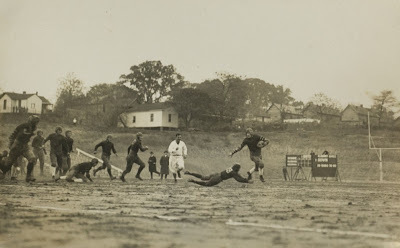 for a 7-yard gain against Georgia in the 1922 game. 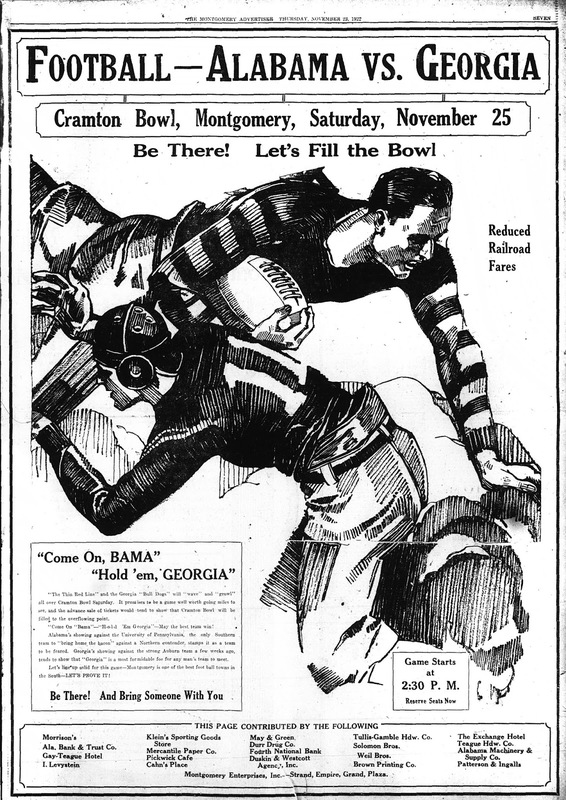 When Montgomery's Cramton Bowl opened in 1922, Alabama's "Thin Red Line" was intended to be the inaugural game for the stadium. Instead, the university's freshman squad was granted the honor as UA president George H. Denny succeeded in having the planned showdown with Georgia relocated to the venue. It seemed a sharp business move as the Bulldogs under Herman J. Stegeman had become a southern power rolling up a 15-2-2 record the prior two years. As the Alabama game approached, Georgia's record wasn't as stellar as expected since the Bulldogs had not won a game in November, starting with a tight 7-3 loss to Auburn the first Saturday of the month. The Tide, meanwhile, were riding high after defeating John Heisman's University of Pennsylvania squad just three weeks prior. The full page ad in the Montgomery Advertiser for the Cramton Bowl contest explicitly noted this feat. In the first quarter Alabama was driving to the end zone with Charles Bartlett completing key passes to Pooley Hubert and Alan MacCartee to reach the Georgia eight-yard-line. Then disaster struck as MacCartee fumbled and the Bulldogs' Fletcher recovered and galloped ninety-five yards for a touchdown. It would be the Bulldogs only score of the game. Bama's Bartlett scored on a four-yard run late in the first half and then booted a field goal in the third to put his team up 10-6, which would prove to be the final score. 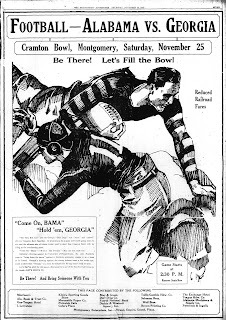 The game would be the last for Georgia's Stegeman who was replaced by George C. "Kid" Woodruff the following season. Alabama would go on crush Mississippi A&M the following week to conclude the 6-3-1 season and bring the tenure of head coach Xen Scott to an end. The Tide would be led by Wallace Wade in 1923.